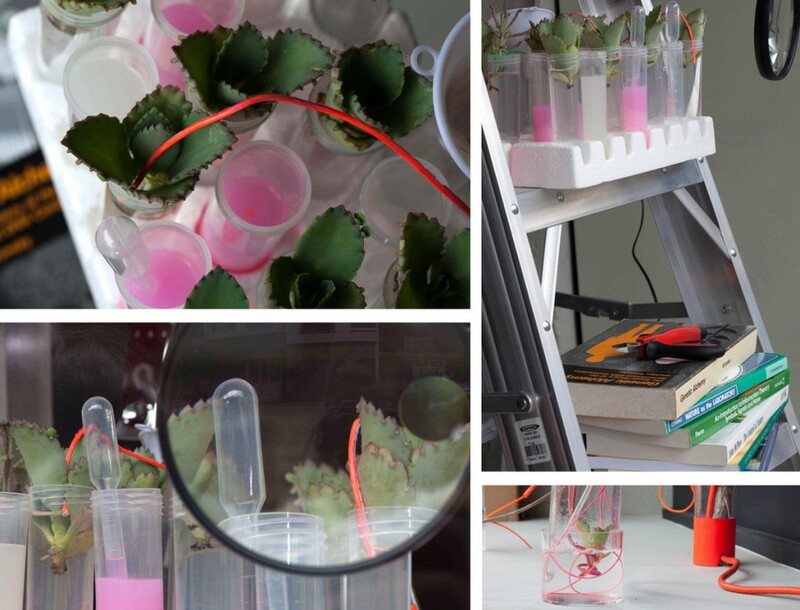 Speculative Arboriculture is a series of site-specific sculptures and video pieces that address issues around synthetic biology, plant intelligence and invasion ecology. 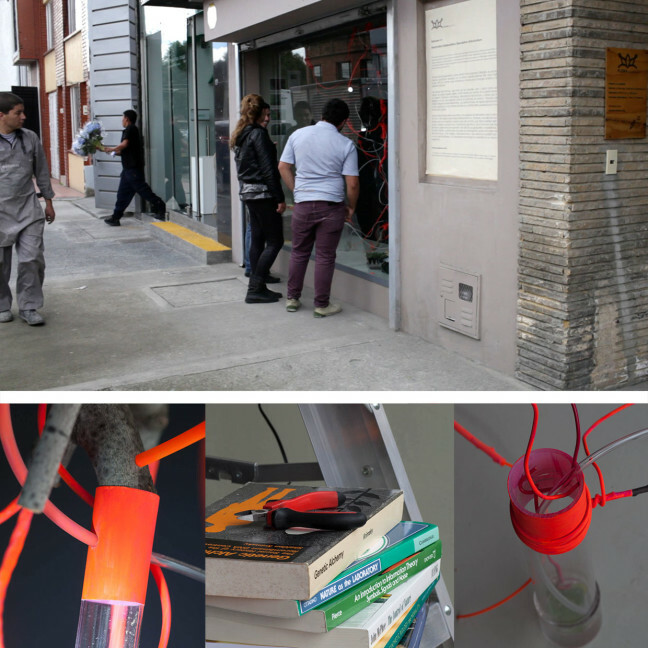 The most recent version of the project was commissioned by FLORA ars+natura, a contemporary art space in Bogotá, Colombia with a focus on connections between environment and artistic practice. I created the piece for their Cabinet program, which invites artists to install in a street-facing vitrine that is visible to the general public on a daily basis. On view from July 5th-July 26th, 2014, the piece is made from the vines of the invasive oriental bittersweet plant (Celastrus orbiculatus) combined with salvaged branches, electronics, wires and aquarium tubing. 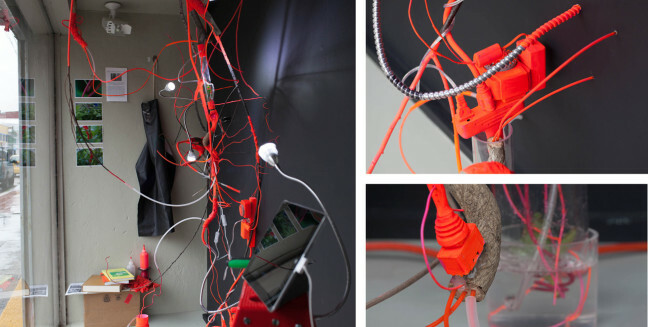 These disparate materials are assembled into a series of interwoven plant-like forms encased in layers of acrylic paint that glow hazard-symbol orange. The sculpture also hosts a small colony of mother of millions (Kalanchoe daigremontiana) seedlings, a rapidly reproducing, toxic and very tough plant ideally suited for the oncoming environmental changes caused by global warming. With branches sprouting in tangles from the walls, floor and ceiling of the space, the project references the potency of rapidly evolving genetic modification and the erratically expanding geographic and ecological ranges of plants and other organisms in our globalized era. Appearing simultaneously clinical and overrun, the space suggests two possibilities: a controlled lab setting for the study of synthetically generated plant life, and a quarantine room for an out-of-control invasive species under close observation. Installed next door to a flower shop, the piece contrasted sharply with the voluptuous bouquets sold next door. Colombia is well known for its participation in the international cut flower market; the piece drew additional meaning from the allusion to globalization as reflected in the spread of invasive species and the distribution of plants as commodities for world wide consumption. ‘Speculative arboriculture’ / Ellie Irons en el ‘Gabinete’ de Flora ars+Natura from Fundación MISOL para las artes on Vimeo.